I like the expression musicality. It is all-inclusive and goes beyond the notion of music and musicians. Musicality has little to do with any particular style of music. To a sensitive ear, ordinary sounds can be musical. It all depends on you. As we all know, we can not close our ears naturally. They are receptors which are continuously ‘on’ and are receptive to sounds all around us – 360 degrees. The ears are not directional like the eyes. This very fact makes it easy to experience a sense of a connection to the whole – or a sense of oneness – through conscious listening. 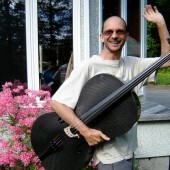 How I came to find and enjoy playing on a cello made from carbon fibre: "The instrument I play on was designed by Luis Leguia (www.luisandclark.com), a cellist with the Boston Symphony Orchestra. 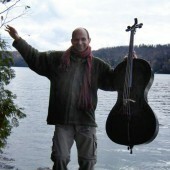 It sounds very similar to good wooden cellos – I own an old wooden cello from the late 18th Century. At the same time it is a little richer in overtones and has a larger dynamic range (louder sound). It also responds very well to plucking in the higher and lower range." Cet article a paru, en anglais, dans l’édition de novembre 2006 du magazine Viha Connection: "J’ai appris à reconnaître la vraie valeur du chant il y a deux ans, en travaillant sur mon album Soulweaver, pour Malimba Records. Comme je joue la plupart des instruments moi-même (le violoncelle, le dilruba, la guitare, la basse, les flûtes et d’autres encore) et que je compose par improvisation, le processus d’enregistrement est pour moi une aventure longue et solitaire..."
An article which I wrote for the Viha Connection magazine: "Giving real value to singing started during the time when I was working on my album 'Soulweaver', for Malimba Records, two years ago. 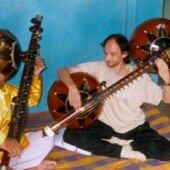 Much of my recording work is a long and solitary journey as I play most of the instruments by myself (cello, dilruba, guitar, bass, flute, plus many others) and I compose through the use of improvisation. 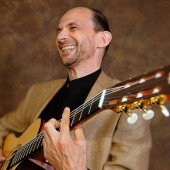 Listening carefully to what I play spontaneously, I then slowly crystallize the melody lines." An interview originally published in the online magazine Osho News: "I pick up Kalyan at the Corfu Buddha Hall where we had just enjoyed the singing group with Deva Premal and Miten, and head to my favourite coffee shop with the view over the beach of Arillas to one side and that of Agios Stefanos to the other. The wind blows the awnings and shifts the shadows of the sun on our table." 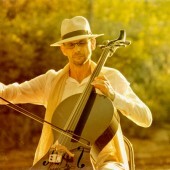 What inspired me to shoot myself the photographs for my CD 'Liquid Cello': "From the very beginning I was fascinated by the visual aspects of the carbon cello and the fact that it is not made out of wood. And I wanted to show that music is responsive and fluid like water. So I started with experiments in my bath tub and soon decided to go down to the lake behind my house. 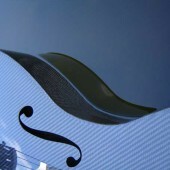 I happily spent the summer taking shots of my cello in different lighting, reflecting the ever-changing moods of water."